Hearts of Iron II is still fun, but now is educational, as it's being used to teach college students about WW2. Hearts of Iron II is one of those strategy games that, if you can get past its steep learning curve, is supposed to be a great deal of fun with a ton of replay value. While the game is certainly well-regarded for its depth and realism, no one's considered the game to be an educational tool until now; a Political Science course at University of California, Los Angeles is using the game to help teach students about what led up to World War II. The game is being facilitated by a student named Einar Engvig, who realized the game could be, "used in order to equip students with a better grasp of the Theory of Tripolarity and the general geopolitics of the world in the build up to WWII." Students were given an introduction to the game and were then split into two-player teams. After this, each team was then given a specific nation to control and given unique objectives to accomplish through either aggression or diplomacy. "In terms of game specifics, the countries assigned to students were Poland, Yugoslavia, Turkey, Italy, Japan, Argentina and Brazil. Poland went on the offensive and annexed Lithuania, Latvia, Estonia as well as Czechoslovakia; this has made most students very scared of them. "Italy has struggled in Ethiopia and has not expanded much beyond this. Yugoslavia first took Albania and then was able to take half of Bulgaria in a peace treaty after an arduous war. Although it takes at least a year for this treaty to expire, Yugoslavia simply allied itself with Turkey, and the two countries split up Bulgaria and are planning the same for Greece. "Turkey declared war on Persia and has struggled to annex the fledgling state. Japan has kept to itself in its war with China. I have told Japan that they have the ability to turn the tables in South America. Brazil and Argentina, interestingly enough, allied with each other immediately and have annexed at least three countries one after the other. "However, I secretly spoke with the team of Argentina and they are in a panic, as they understand that their more powerful partner Brazil can easily turn the tables on them in the future. Needless to say, Argentina is feeling abandonment/entrapment fears, an alliance dynamic we have gone over during lecture/discussion." According to GamesIndustry.biz, student feedback to the program has been pretty positive. 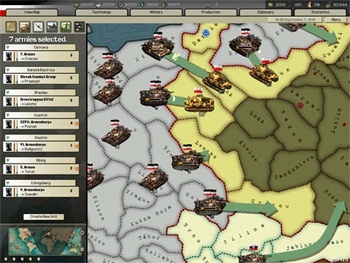 Some have said that the game has made history more interactive, which makes its easier to understand and remember important information about the historical period. Also, some non-gamer students have stated that they plan to keep playing Hearts of Iron II after the course ends.